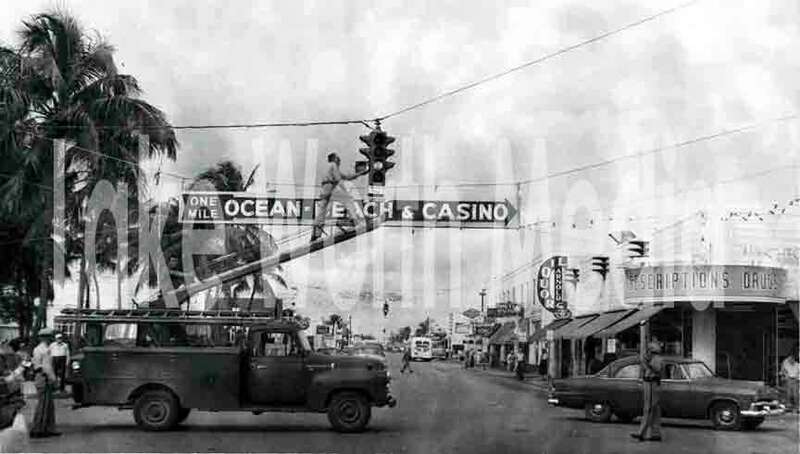 All restorations in this and the previous sections of the Casino Photo History are by William Coakley. Unathorized reproduction or distribution is prohibited. All rights reserved. 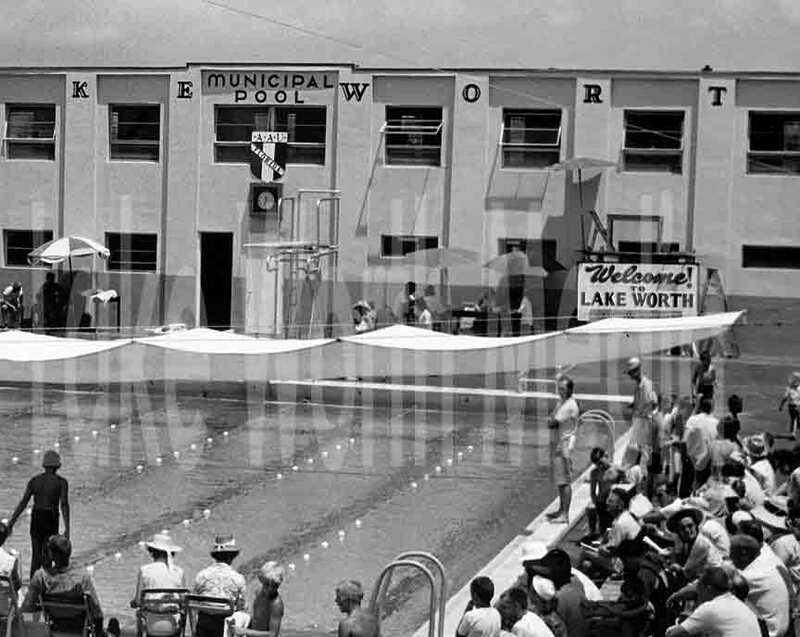 Thanks again to the Lake Worth Museum, Palm Beach Historical Society, Bruce Webber, Dennis and Doris Dorsey, and Barry Freedman (Lake Worth Beach Tee Shirt Co.) for helping make this Photo History of the Casino a reality. So here's what they came up with for the new Casino which was built around the old structure. 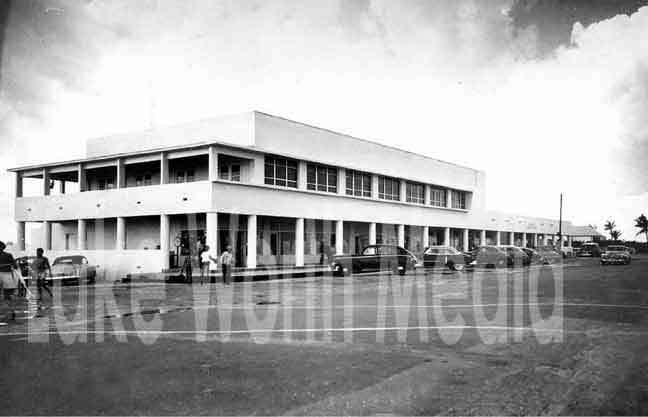 It was in operation ca 1950 and the beautiful architecture of the original Casino was exchanged for a sleek modern straight line look popular in the early 50's. Today the curves are back in and the straight line design makes most of us think more of a medical building than a community center. The picture at the bottom of the postcard shows a couple of weight lifters walking with their kids. There was quite a weight lifting gym in the bath house portion of the Casino where the lifeguards and others worked out. 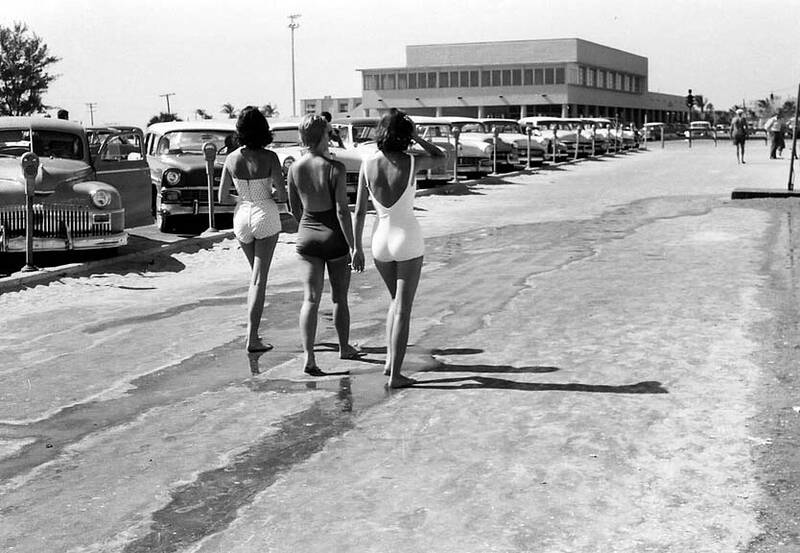 It was an early version of Muscle Beach. These were a couple of its products I'm sure. 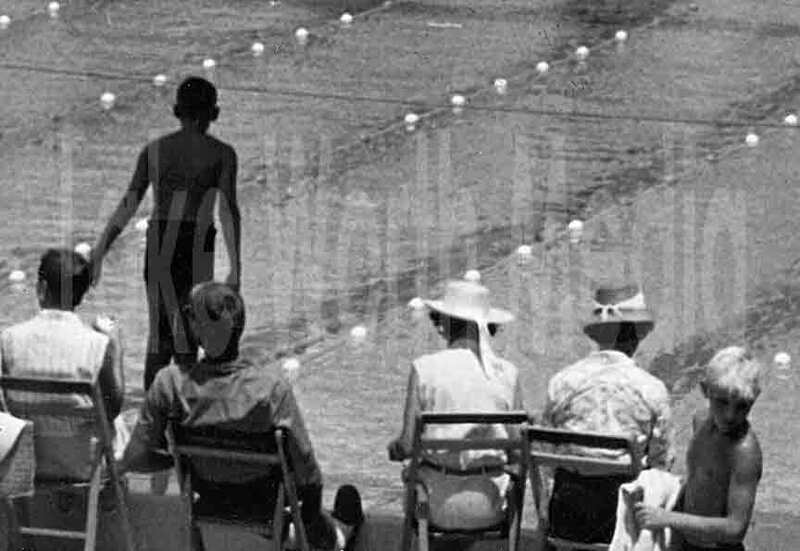 This picture is ca 1950. Recognize anyone? 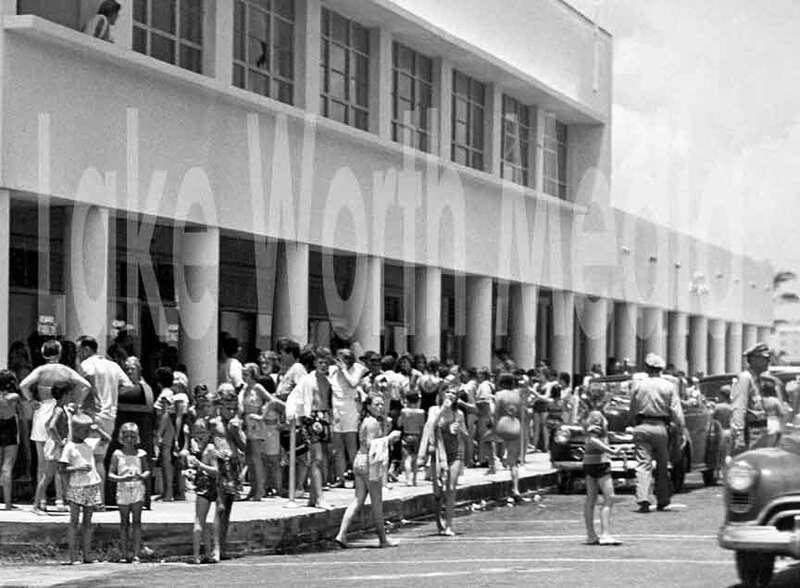 The kids in the foreground would be in their late 60's or early 70's today. And broken windows upstairs are nothing new. 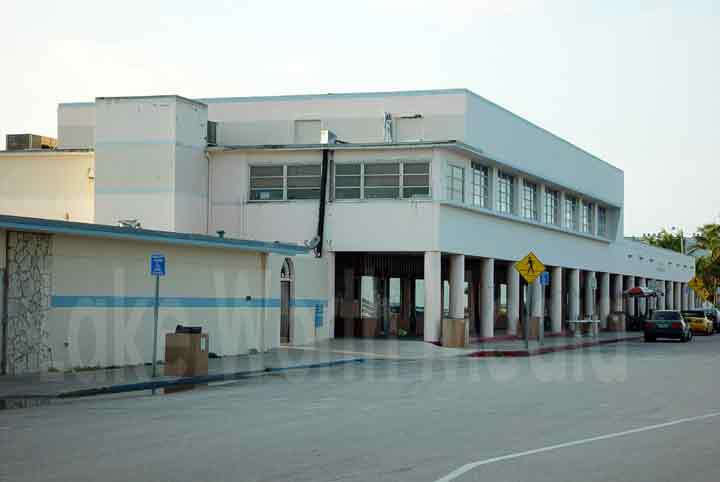 At some point, it was decided to enclose the porch/balcony on the south side of the new Casino building. 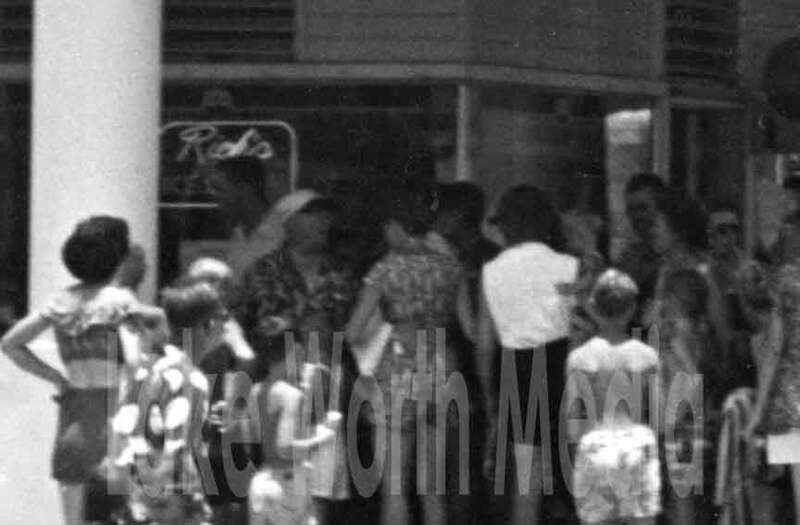 This is a fragment from the picture above showing a line up for Rich's Ice Cream located on the SE corner of the Casino. The above is courtesy of Webber Galleries and has been restored. 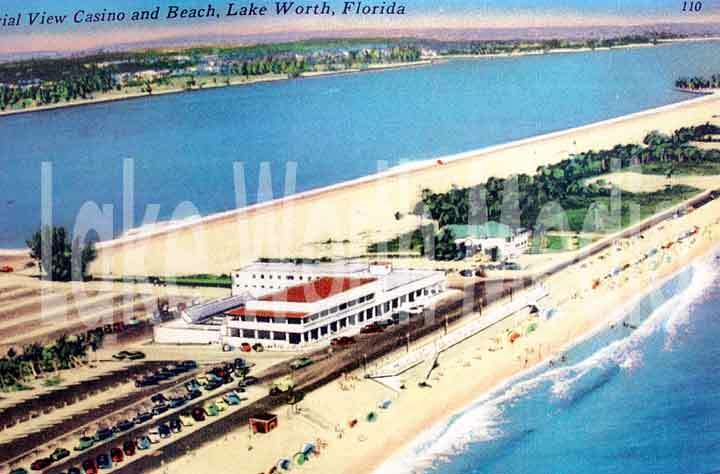 Another postcard from Webber Galleries that has been restored showing the outlet of the tunnel under A1A. 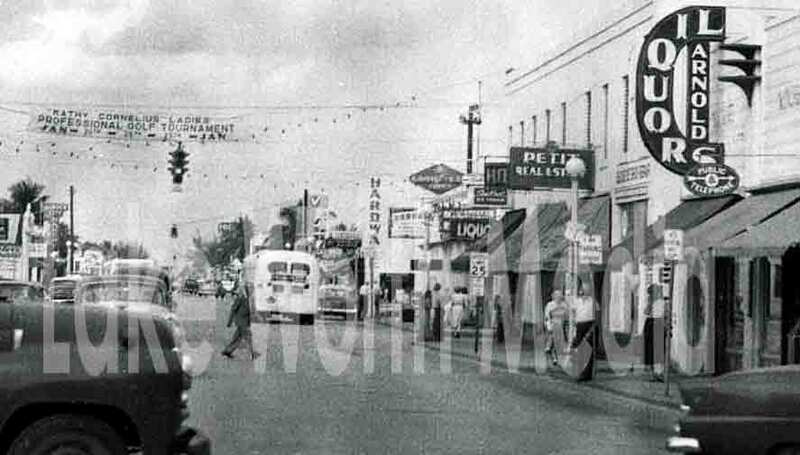 Meanwhile, downtown Dixie highway (looking north) has a lively share of Liquor stores including Arnold Liquors which had been around for decades. Petit Real Estate can be seen along with a Hardware store. But the catch of the day, is the banner hung across the road which says: KATHY CORNELIUS LADIES PROFESSIONAL GOLF TOURNAMENT. And below that are the dates in January of that year which appears to be around 1953 judging from the cars. The above picture is a crop of the original restored photo below. Kinda miss the drugstore on the corner thing? 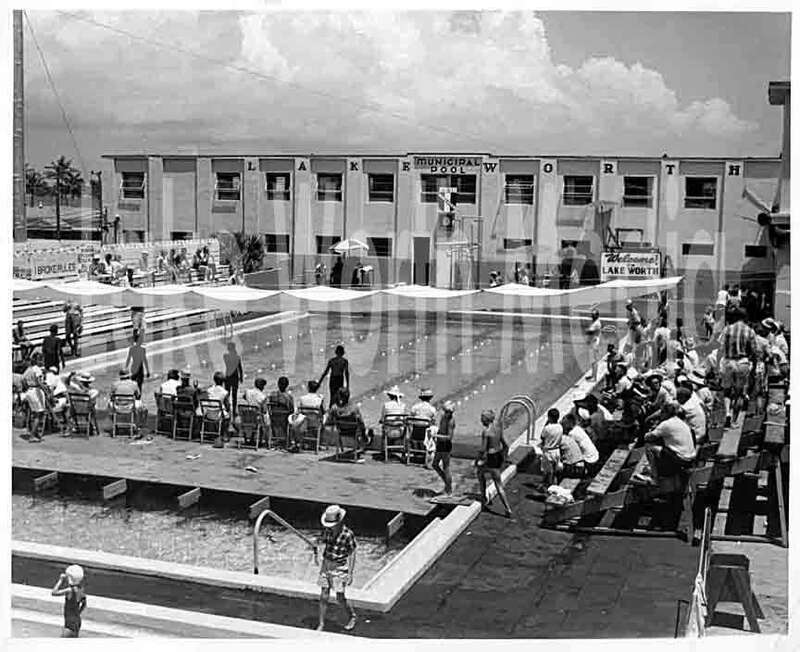 Since its inception the Casino and pool were a magnet for kids and every kind of swimming competition imaginable. In this picture, it is 11:35 AM by the clock and the competition is warming up. Lot's of interesting stuff in this photo made available for restoration by Dennis and Doris Dorsey. Off to the distant left behind the bleachers was where the "Broke Rules" area was... presumably for timing out kids for chewing gum, playing tag or other offenses which are listed on the sign. Email me if want a close up of the sign. 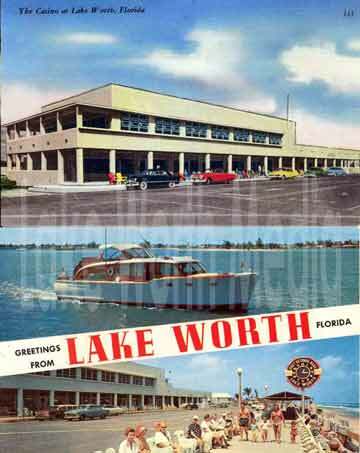 The bath house is in the "L" portion of the Casino which was torn down some time ago. The scoring was done on the third floor where at one time they also had a radio show. The changing and equipment rooms were on the basement and second floor. 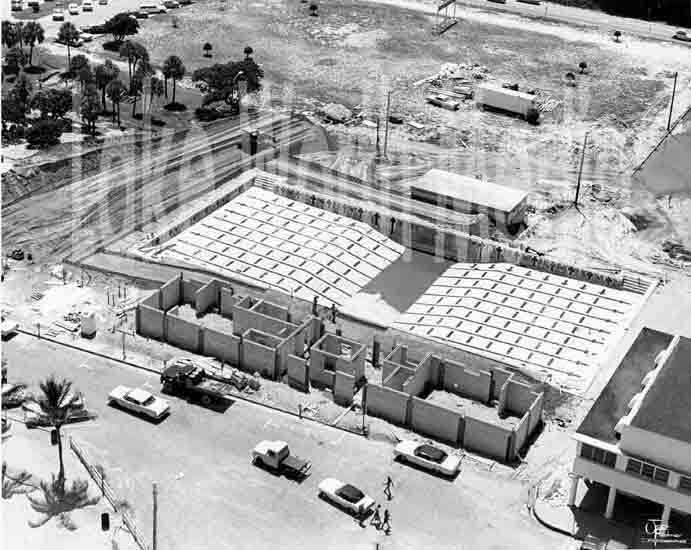 Then about 1969, a new fresh water pool was constructed which is still operating today. 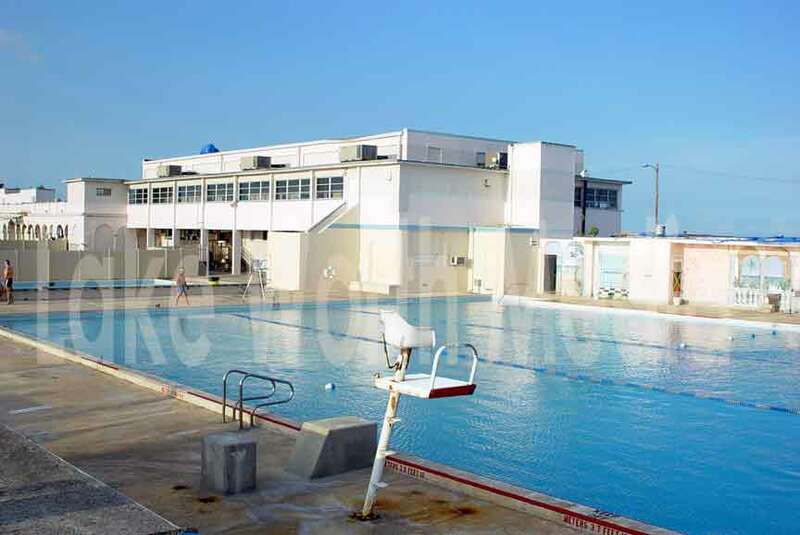 Unfortunately the city has never converted to a safe form of chlorinating the pool and so it still relies on chlorine gas containers that have to be delivered and stored next to the pool. This is 1960's technology being used for our pool. 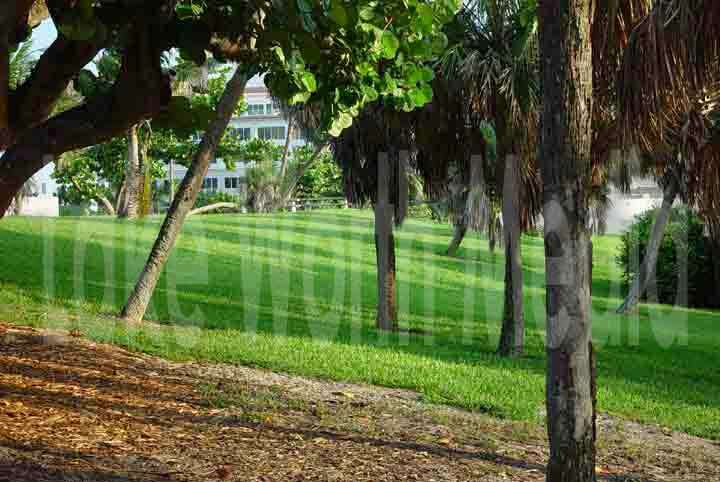 Even here we can see the lack of any ornamental shrub maintenance. 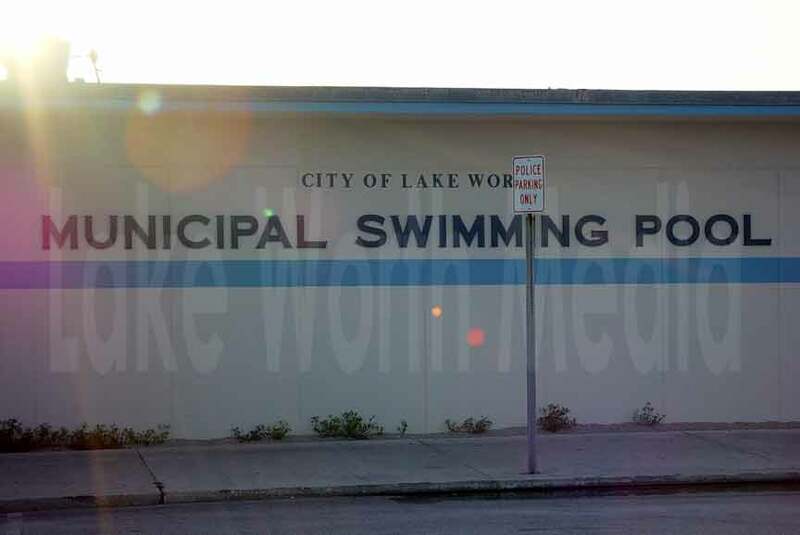 When I called one day, I discovered much to my surprise that the lifeguards don't even have a city phone over there. When you call the pool, a lifeguard answers ON THEIR OWN CELL PHONE at their expense! For decades the city has spent countless millions on just about everything imaginable... but not for the Casino. It has been allowed to deteriorate and thoughts of restoring the original design with a balcony surrounding the upper floor have been bantered about but it was incorrectly assumed that this structure had to be torn down. That assumption was based on the false premise that they couldn't put the businesses in the Casino out of business while the building was restored. No one thought of the obvious... putting all but one of the businesses in temporaries while the building was restored. So as time went on many plans were considered, beach committees established and yet it has been said that no agreement could ever be reached so in frustration with years of delay, they decided let outside development secure a future for the beach. In my view, this was a decision made in gross error and ignorance as to how to effectively arrive at a consensus that honors the public will. 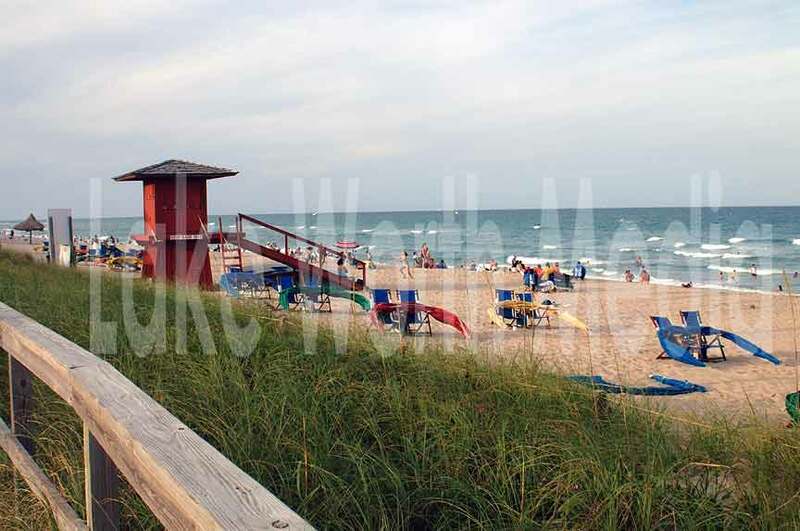 These lifeguard houses no longer exist and a strange concoction of scaffolding has taken their place in lieu of spending any money. This is where the Greater Bay Casino building is supposed to be built. The Greater Bay plan significantly reduces convenient beach access. 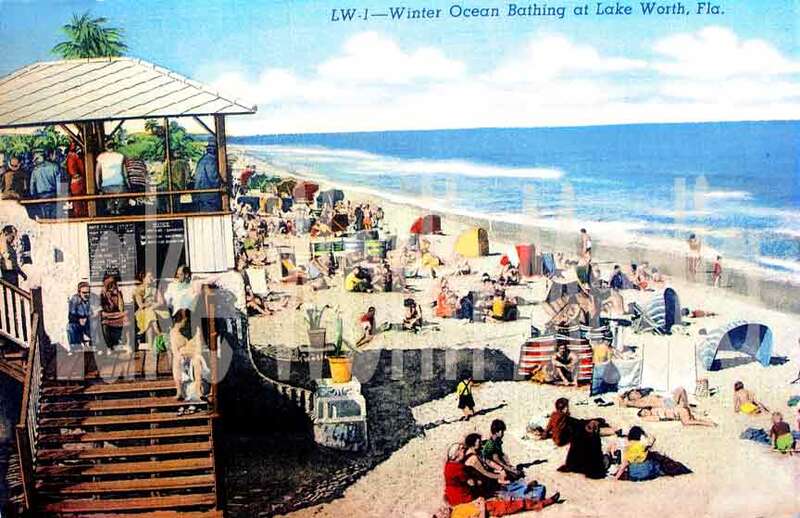 Upper level beach front parking will be reduced by 90% and avoiding Cony Island push cart vendors and other commercial activity will become impossible on the 600 foot average treck to the beach. Although the Greater Bay new Casino building will have about the same footprint as the current Casino building and it is supposed to look like the original building... it will be twice as high as the original building which will significantly throw off the original pleasing proportions of the design.